That is quite the ambitious list. And the original iPad simply could not live up to it. Just as an example, there is no way the original iPad was better than a PC laptop at gaming. Another would be browsing. At the time, most of the internet required Flash. The iPad simply could not access much of the web’s content. Even at 9.7”, the screen was too small. We didn’t have mobile responsive web design at the time. No, the iPad was not better at everything. And it could not fulfill its charter. But Steve Jobs was wrong when he declared that if the iPad wasn’t better at all those things, it had no reason to exist. That is too much pressure for any product. The original iPad wasn’t the best at a lot of things. But it most certainly had a reason to exist. The iPad started doing something that wasn’t on any of the slides. It started cutting deeply into PC sales. Within the first year, a shocking number of people were buying iPads and using them as their primary computer. No one anticipated that. So big was the phenomenon that Microsoft was forced to react until they finally changed the course of Windows and the PC forever. If you use a modern PC, you have the original iPad to thank for how it looks and works. The iPad would eventually live up to its charter. But it wouldn’t be until the iPad mini in general, and the iPad mini 4 specifically. While almost all iPads were great (we could have done without the iPad 3), they were all too big for the Jobsian manifesto. Jobs spoke of holding the internet in your hand. But the internet was a 10” slab of metal and glass. And it weighed a pound and a half. The internet was big and heavy, and got rather fatiguing to hold after a short time. If you had a bit more browsing to do than that, you would have to find a internet that you didn’t have to hold. The same was true for all the activities the iPad was supposed to be better at doing. It may have been better at some of them for short periods of time while sitting in the right chair. But all of those activities have long-form versions that can take quite a bit of time. For some people, triaging email is a major undertaking. Reading a book requires lengthy sessions. You can lose a day browsing the web. Just check with your kids if you want to know how long a gaming session can last. Do you really want to hold an iPad for the length of a movie? This is not to say that the iPad was a bad machine. It is to be honest about its size and other shortcomings. Steve Jobs famously wrote one-word email responses. If you had a little more than that to say, the onscreen keyboard was not a good solution, neither was the accessory keyboard Apple offered. Responding to mini tablets put out by Amazon and Google, Apple finally relented and released the iPad mini. This one small step for iPad was a giant leap towards fulfilling Steve Job’s original vision of what the iPad was meant to do and be. Simply by making a device that was many times easier to hold for longer periods of time, Apple made the iPad a better machine for every activity on that original slide. It wasn’t perfect. It still had a ways to go. The first mini was underpowered. Again, it was no competitor to PC gaming. But you could hang in a casual gaming session a lot longer than before. By having less to hold, you could hold it more comfortably, and for a longer period of time. It also freed your other hand for navigation. When browsing the web, you need a free hand for tapping and scrolling and pinching and zooming. You would never be able to do it if you had to hold a laptop in one hand. But with the iPad, you have to hold the device. It is a more visceral experience. But it comes at a price. The iPad mini plus mobile responsive websites is the perfect combination. I used to be a big fan of physical books. Going to the bookstore was as exciting to me as going to the electronics store. The only thing I don’t like about books is the form-factor. They are thick bricks of paper that have to be held by at least one, and sometimes two hands. The stiff spines make it difficult to read the parts closest to the inside margin. Despite that, I admit to having some nostalgia for the printed book. But I would never want to go back to reading that way. I jumped on electronic books as early as possible, and never looked back. I also listen to a lot of audio books. I still love books, just without the book part. Steve Jobs was too in love with skeuomorphism. He understood a book as a handheld object with pages you turn. He saw reading as something best done in a comfortable chair, possibly with a glass of wine on a nearby stand. He wanted to duplicate that experience electronically. He was wrong. You can just as easily read for an hour in a desk chair with good posture, looking at a giant monitor with adjustable font sizes, and occasionally scrolling or clicking a NEXT button onscreen. One’s hands could be free. Or one could eat a snack while reading. Or one could even take a break and have the computer read aloud for a while as one paces in concentration. In a digital world with many possible right answers, there is no reason to be bound by a restrictive modal experience. Steve Jobs wanted to recreate the modal experience of reading a paper-back book as if that was the best and only true way to enjoyably receive the content. He even had page-turn animations to remind us of the only mode proper for reading. There is plenty about the paper-back book not to like besides the paper. They can be difficult to carry. And don’t think about trying to carry more than one at a time. They are difficult to manage when you have other things to hold. They can be awkward when standing. The print size cannot be adjusted for comfort. And it can be too big to handle if it is a very long book. The original iPad could address some of these problems. But it was still largely a two-handed job, retaining most of the problems. In real life, no one carries around 10” books if they can help it. By becoming a one-handed experience, the iPad mini solved almost all the inherent problems of books. It is almost the perfect book-reading experience. Page-turn animations not required. The iPad mini is as easy to transport as a paperback, and considerably more so than three paper-backs. It is the same size and weight regardless of the length of the book you are reading. Ebooks is just one example of how the iPad answers one of the challenges on Steve Job’s list. Moreover, the mini far exceeds the original at doing the task. I contend that the mini, especially the mini 4, far exceeds the original at doing all of the tasks. It is the iPad Steve Jobs described, but was reluctant to deliver. One would think that bigger would be better with regard to video. One would be wrong. If that was the case, then a 13” laptop would be better than a 10” iPad. And a 15” laptop would be even better. But no one thinks that way. It is not about the biggest size. It is about the right size for the context. The right size is determined by the usage. This brings us to the difference between portable and mobile. For something to be portable, you just have to be able to port it from one place to the other. For something to be mobile, you have to be able to use it while being mobile. The larger iPad is portable. You can move it to a different location, set it up on a stand, and watch video at the new location. While you can do it to prove a point, you don’t really want to hold a big iPad for a 30 minute TV show, or a 2 hour movie. If we were really being honest, we wouldn’t want to hold it at all for the purpose while on public transit, or standing in a line. But the mini is not just portable. It is mobile. You can sit in one place and hold it without the need for a stand. And you can use it while on a train or standing in line. The mini 4 is at the upper limits of the size and weight that is comfortable to use in this manner. But it is still a mobile device more like a smartphone than a tablet. I have yet to play a game on the iPad mini that would benefit from a larger screen. Then again, I have limited tastes when it comes to games. I love puzzle games, classic board and card games, dice games. Fine, Candy Crush in all its incarnations. That sort of thing. I used to be a huge fan of Real Racing before it became a IAP nightmare. No one would buy a portable gaming device the size of the big iPad. The iPad mini is on the edge of being too big for gaming. But it’s weight and thinness keep it just within the range. There is a human equation to screen size of a handheld device. Our arms are only so long. We cannot use the device any further away than our arms will allow. But it is not just a matter of arm length. We do not hold things as far away as we can. For maximum support and comfort, our arms need to be in a certain position which is closer to the body. The optimal position is with our elbows tucked into the body for support. That isn’t much more than 15” away. At that distance, the iPad mini is a big screen TV. Price is not the only reason most people don’t own 60” TVs. Apartment living rooms are not big enough to get far enough away from the TV so that the picture is still good. Regardless of size, we hold the iPad with elbows to side for support. We can’t hold it any further away comfortably. That is why there is no need for a larger screen size for things like gaming and video watching. Even if you could make the bigger iPad lighter, it is still too big for that distance in terms of gaming and video watching. The mini is optimal. 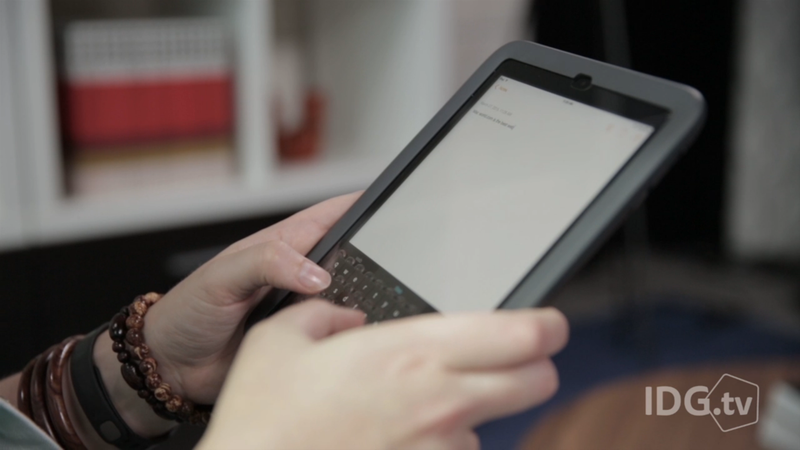 No size iPad is big enough to make typing on glass a comfortable experience for touch typists. The 13” pro comes close. But anyone serious about typing on an iPad, regardless of size, is using an external keyboard. An external keyboard makes the size of the iPad irrelevant. But if you are using the iPad as the stand-alone device it was meant to be, you are not trying to touch type. You are likely thumb typing. The mini in portrait is the best thumb typing machine on the market. For those with big hands, landscape. But the bigger iPads are simply not good for thumb typists. Writing short-form emails and chat messages are much better on the mini. That also goes for typing passwords, URLs, and search queries. You don’t want to have to take out an external keyboard for those kinds of things if you can help it. You want a device on which you can enter information without changing your mode of operating it. If you do happen to have real work to do, by all means, bring a keyboard. Unlike with a smartphone, it doesn’t feel ridiculous using a full-sized keyboard with that device. It is not a laptop replacement. Nor does it pretend to be. But it works well in a pinch. Still, if you are carrying an iPad and a laptop and you have a lot of writing to do, use the laptop. Using the iPad in that situation is little more than a stunt. Apple’s marketing slogan for the iPad mini is two words, each set off by a period: Mighty. Small. That pretty much sums it up. The mini 4 has enough processing and graphics power to feel like a competent device for all the tasks you would want to throw at it. There is no better way to experience games optimized for this type of device. There is no better way to read books while on the go. There is no better way to deal with email or brows the web when mobile. There is no better mobile TV you can buy at any price. These are not things that could be credibly said about the original iPad. That said, the original iPad changed the world of computing forever. We owe it many thanks. But we had to wait until the iPad mini 4 before the bullseye was finally pierced. It is the embodiment of everything the original iPad was aspirationally. It is the truest iPad ever. And it is not done yet. At least, I hope not. I am looking forward to seeing what apple has planned for the next mini. It seems a mini Pro is a lock. When it has pen support, it will also be the best way to take notes and quick doodles. I hope it gets 3D Touch, as I miss it when using the mini. And I hope it gets the TrueTone display. The mini 4 has so much more to recommend it. It’s better for using in bed. It’s better as an iPad around the house. It’s better for all the people in your life with smaller hands. It’s better for managing and enjoying music. It’s the best iPad for taking pictures. In some cases, it is even pocketable. I have a 10” iPad Air. And I pick up the mini almost every time. Given a chance, I think you will too.